When you purchase $500 in gift cards you will receive a complimentary $100 gift card for yourself. Purchases must be made within the same transaction. When purchasing a gift certificate, Our Gift Card will be mailed to you or the recipient of your choosing within 72 hours of your purchase. You can specify the recipient for each certificate that you add to your cart. Please add special shipping instructions to the ‘Order Notes’ field upon checkout. We also offer overnight shipping for an additional charge for those last minute orders. 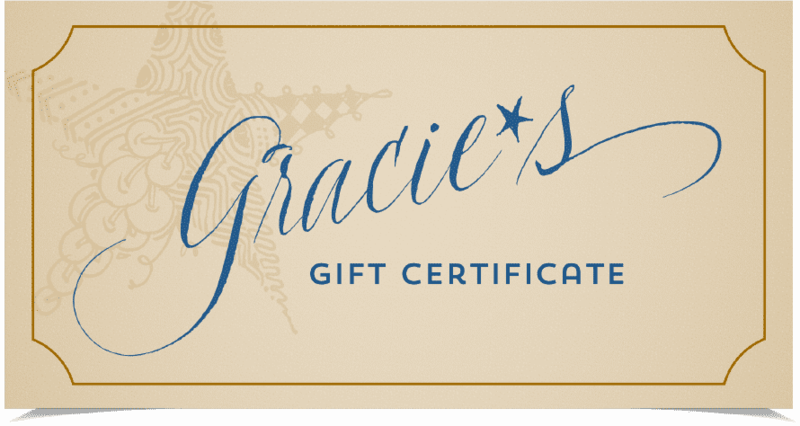 Thank you for entrusting in Gracie’s for your gift giving. SKU: GC. Category: Gift Certificate.